Don't you sometimes hate that you are an adult? 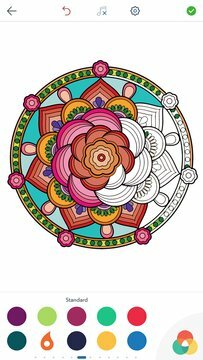 Try Mandala Coloring Pages - adult coloring book with amazing mandala designs and coloring pages for adults. Make a quick run-away from stress of the adult life and stop thinking about work, troubles raising kids and financial problems. 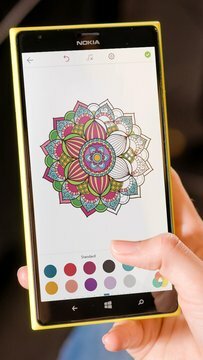 You are the most important person in your life – the best you means the best for people around you, SO GET MANDALA COLORING PAGES NOW AND NOURISH YOUR MIND! Nourish your mind with Mandala Coloring Pages - relaxing adult coloring book. Mandala (Sanskrit: “circle”) is a geometric shape that has no beginning or end. Would you be surprised to learn that mandalas have existed since the beginning of time? Are you aware that you witness mandala’s beauty every day? Mandala shapes are around us - the Earth, the Sun, the Moon, nature and life itself. Mandala coloring books have spiritual and mindful characteristics, relieve stress and inspire creativity in people. Adult coloring books containing mandala drawings and patterns such as mandala flower, for example, have been proven to have anti-stress impact on people and recover the mind. A mandala coloring book is made of detailed coloring pages and complex mandala art design that require full attention and focus. This helps you to express your feelings through coloring and creates a feeling of accomplishment once you've completed your coloring page. Download Mandala Coloring Pages and start a mind journey to the world free of anxiety and stress! Mandala coloring pages can be a great way to utilize mandala in practicing mindfulness and focus, or as a simple relaxing activity. Many cultures used them throughout the centuries as a part of their spiritual practice and religious rituals. Buddhists, Tibetans and Hindus have all derived meaning from the mandala and its beauty. Swiss psychiatrist Carl Gustav Jung called the mandala “a representation of the unconscious mind”. He used the mandala for his personal growth and with his patients during psychotherapy. It is widely recognized that drawing of a mandala is a meaningful reflection of its creator. While coloring a mandala coloring page, colors should reflect the inner moment of self at the time of creation. Personal feelings, emotions and instincts should guide the coloring activity of a chosen mandala. WHAT IS THE HEALING POWER OF MANDALA COLORING BOOK? How can mandala coloring pages activate the mandala’s healing power? Healing powers of the mandala come from circular shape that promotes relaxation, balance and supports healing. The circular design of a mandala promotes healing and positivity. How? Mandala has a center point that represents a place from which everything is possible. This circular matrix is a sacred shape that promotes possibilities and unlimited potential. The good news is that everyone can achieve all those effects by spending some time coloring mandala coloring pages. Have fun in this relaxing coloring experience and refill your energy! Download Mandala Coloring Pages now!